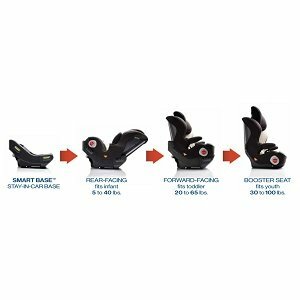 Smart Seat grows with your child from 5 lbs. up to 100 lbs. for the ultimate in carseat longevity. When your child grows out of the harness, store it easily in the convenient compartment. The neutral Rosin style is great for boys or girls! Graco’s top-rated Smart Seat All-in-One car seat could be the only car seat you’ll ever need. It helps keep your child secure in a 5-point harness, from a small 5 lbs. all the way up to 40 lbs. When your child is ready, it easily transitions to a forward-facing seat, for a child from 20 – 65 lbs. in a harness. Finally, it converts to a belt-positioning booster for children from 30 – 100 lbs. It’s like having three terrific car seats, in one! The National Highway Traffic Safety Administration (NHTSA) has recognized Graco’s Smart Seat with the highest government rating for Ease of Use in all Modes. 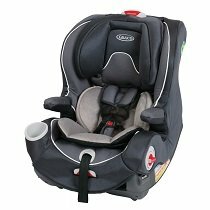 All car seats rated by NHTSA meet Federal Safety Standards and strict crash performance standards. While all rated seats are safe, they do differ in their ease of use in four basic categories: evaluation of instructions, vehicle installation features, evaluation of labels and securing the child. 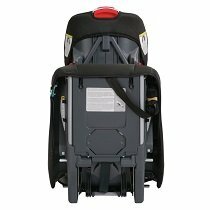 The Smart Seat from Graco received a five star rating in this evaluation. Once the base is installed, you want to know that the Smart Seat is locked in securely to the base. Graco has taken the guesswork out of this process by adding seat-to-base locking indicators, which help to ensure that the car seat is properly secured to the base. 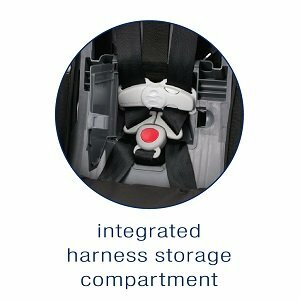 As your child grows and doesn’t need to ride with a harness, Smart Seat has a convenient, integrated harness storage compartment. It holds the harness straps when you’re not using them, when Smart Seat is in the belt-positioning booster mode. To make sure your child is riding at just the right angle, Smart Seat includes an easy-to-read level indicator on the seat. It really eliminates installation guesswork for you, mom! Smart Seat features an “on-the-go” five-position recline, so that you can recline your child while he / she is in the seat. It’s a great convenience feature busy moms will love. Clean ups are easy with Smart Seat: the seat cushion is machine-washable and the metal and plastic parts may be cleaned with mild soap and water. 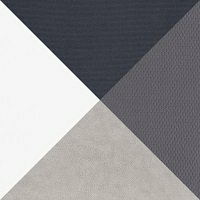 The soft Rosin fashion has a finely patterned gray, accented by textured black and plush, solid taupe and white. It’s a terrific, go-with-anything, gender-neutral pattern for little boys or girls. The seat is comfy for your child and features flip-away armrests for easy entry and exit. The flip-up armrests are comfy for your child as he / she grows, and since they “flip-away,” it makes it easy to get baby in and out of the seat (without having to lift your child up and over). Plus, the integrated cup holder is an added feature kids of all ages really appreciate. It’s important to follow AAP recommendations for car seat use. The American Academy of Pediatrics recommends that children remain in a booster until they are at least 4 feet 9 inches tall. 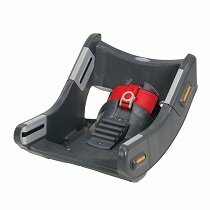 The Smart Seat base is a favorite feature of experienced moms – install the LATCH-equipped base once for years of use. Proper installation is key for the safety of your seat, and with the Smart Base it’s easy to get it just right. This ingenious stay-in-car base is LATCH-equipped and includes a belt lock-off for easiest installation, so you’ll just install it once for years of use. After all, busy moms love things that are easy and safe. The steel-reinforced frame is strong and durable, which gives parents peace of mind. For extra strength, safety and durability, the Smart Seat features a steel-reinforced car seat frame. So you’ll feel good about your child riding in Smart Seat for years. 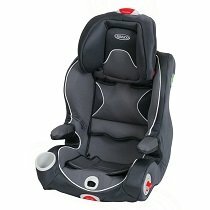 Convertible seat grows with your child; transforms from a rear-facing infant car seat to a forward-facing toddler car seat to a belt-positioning booster seat. Seat-to-base locking indicators help ensure the car seat is properly secured. Easy-to-read level indicator. Fits infant 5 to 40 pounds rear-facing in a harness, fits toddler 20 to 65 pounds forward-facing in a harness and fits youth 30 to 100 pounds in a belt-positioning booster. Smart LATCH-equipped stay-in-car base for one-time install in both rear- and forward-facing modes. Machine-washable cover. 1-hand height adjustable head rest and 5-position recline.